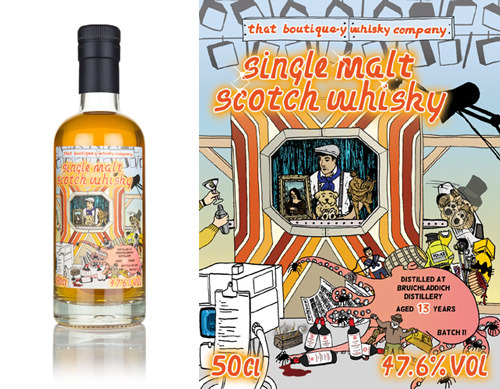 A new label marked our first release from the Dumbarton distillery, one of Scotland’s more recently closed grain distilleries. The Dumbarton Distillery was once Scotland's largest distillery. Built in 1938 where the river Leven meets the Clyde, and on the site of the former McMillan Shipyard. It was a major contributor to Ballantine’s Blended Scotch Whisky. Sadly the gates closed in 2002 and has since been demolished, but what else do you know about this distillery? Dumbarton opened in the 28th of September 1938, and represented a significant investment by its owners Hiram Walker, who were struggling to acquire enough grain whisky to satisfy export demands for their blends. Built on the nine acre site of the old MacMillan Shipyard on the river Leven, Dumbarton took 600 men about a year to complete. Its industrial lines were tempered by its construction in two million red Accrington tile bricks, chosen to mimic Hiram Walker's Canadian distillery in Walkerville, Ontario. The distillery used maize exclusively, imported from Canada and America (naturally, given the ownership). However the stills were modified sometime in the 1990s so that wheat could be used if they so desired. Unusually, they had a “clear wort” process where they separated the mash from the wort before fermentation. It was said that this gave a cleaner, lighter spirit that made for better blending. The ‘clear wort process’ created considerable production of draff from the removed mash, which was much in demand with local farmers. Dumbarton's column still was an American design rather than the traditional Coffey still, manufactured by Vulcan Copper & Supply Co. of Cincinnati. It could produce both potable whisky and neutral grain spirit, but was designed to work only with maize - possibly one reason for the clear worts process. Sadly the distillery was closed in 2002 as it proved to be impractical for the column stills to be replaced without destroying the still tower completely. The distillery was mothballed, and in 2008 demolition began, and soon only the still tower was left, as something of a local landmark. It took until 2017 for the still tower to be demolished, and the site will soon be home to housing. It’s capacity on opening was 3 million imperial gallons (13.6 million litres) which is pretty impressive. Prior to its closure in 2002 it had the capacity to produce 25 million gallons (113.6 million litres) and at the height of it’s production it was the largest grain distillery in Europe. At its peak in the 1960's the Dumbarton complex with its distilleries, warehouses and bottling plant employed nearly 2000 people. There were two malt whisky distilleries housed within the Dumbarton complex? The Inverleven distillery was built at the same time as the grain distillery. By historic coincidence the distillery sat right on the famous Highland Line, but it was always regarded as a Lowland malt. The other malt distillery, Lomond, sat adjacent. The Lomond distillerys claim to fame was that it was where the first example of a Lomond still was used. But which came first, the still or the distillery? In 1959 the owners acquired around 100 Chinese Geese who were encouraged to patrol the grounds as guards over the spirit in the bonded warehouses. They were known locally as ‘The Scotch Watch’ The geese became part of the tradition of the facility and were featured in advertising for Ballantines, and even became a small local tourist attraction. At one time there were 120 geese led by a gander called Mr. Ballantine. In 2012 the seven remaining birds were retired from their duties, and ended their day in a sanctuary in Glasgow. Our first bottling from the Dumbarton Grain distillery is a 22 Year Old, bottled at 47.8% abv, and is a release of just 155 bottles. Jim Murray once said that the top-notch new make spirit was probably the fattest currently made in Scotland, so our label plays on that heaviness of the grain...Oh we are a giggle eh? Nose: Creamy rum and raisin fudge, cocoa nibs and cherries. Taste: Well-worn leather and a bitterness that in time reveals sweet vanilla and cherry flavours. With four batches launched recently we thought it was high time we took a closer look at the iconic Campbeltown distillery. The Springbank distillery is just one of three surviving distilleries from the once thriving Campbeltown region that had more than 25 distilleries in its late 1800s heyday. Springbank is built on the site of the previously illicit still used by Archibald Mitchell was officially founded in 1828 but, what else do you know about this distillery? The first reference to Campbeltown whisky is recorded in 1591 and by 1814 there were 22 legal distilleries in operation in the Campbelltown area. Springbank was officially founded in 1828, some of the buildings the distillery is housed in today date back to this time, alongside buildings that were used for the long closed distilleries of Longrow, Rieclachan, Union, Springside and Argyll. Brothers John and William Mitchell, Archibald’s sons, take ownership of Springbank. Later, John takes his son into the business, forming the company J&A Mitchell, making Springbank the oldest independent family-owned distillery in Scotland. The equipment at Springbank remains traditional: the Porteus mill dates from the 1940s, they still use an open-top cast-iron mash tun that’s around one hundred years old, and their wooden washbacks are made from boat skin larch. The distillery is equipped with just three stills; one wash still and two spirit stills. The wash still is unique, certainly in Scotland, being both direct fired and having internal steam coils. Condensers are used on the wash still and one of the spirit stills, while a worm tub is used on the other spirit still. Springbank accounts for 80% of their production capacity. The lightly peated (12-15 ppm) was is partially triple-distilled and is often quoted as being distilled 2.5 times. The direct fired wash still works as normal producing low wines, the strongest portion of which are directed to the spirit still charger, while the remainder is redistilled in the intermediate spirit still which has a worm tub. The low wines are put into the feints receiver along with the heads and tails from the spirit still distillation. This mix makes up 80% of the final charge, with the low wines from the wash still making up the remaining 20%. Longrow accounts for just 10% of the distillery’s production It’s a heavier and smokier with its malted barley peated to 50-55 ppm. It runs through a slightly different process to Springbank, with just two distillations with the second distillation carried out in the spirit still which has the worm tub. Hazelburn uses unpeated malt and accounts for another 10% of their production capacity and undergoes standard triple distillation using the three stills in sequence. The Campbelltown region listed by the Scotch Whisky Association was almost resigned to history in the late 1990s when Springbank became the only operating distillery on the peninsular. Glen Scotia was closed in 1984 and remained closed until 1999. When the Mitchell family opened Glengyle, the region’s future was secure with three distilleries, which at the time, was the same number that were located in the Lowland region. While the distillery is well known for being the only Scottish distillery that malts all of its requirements, during the whisky boom of the late 1950’s the maltings were actually closed in 1960. It wasn’t until 1991 that the floor maltings reopened at the distillery. While many distilleries produce a seperate sub-range of single malts that showcase different styles of whisky these days, Springbank were the first. In 1973 they started distilling a heavily peated malt that went on to be known as Longrow. Another range was added in 2005 when the first Hazelburn single malt was announced. Both Longrow and Hazelburn are named after long closed Campbeltown distilleries. The Longrow distillery closed in 1896, and the Hazelburn distillery in 1925. One of the surviving warehouses from the Longrow distillery is now Springbank’s bottling hall. The Springbank distillery is the region's largest employer and was the first distillery in Scotland to become a living wage employer. We released our first batch back in 2013, it was a release of just 2746 bottles, It was very good and was awarded Gold in the Independent Bottlers Challenge that year. Batch 2 followed in shortly afterwards, with a four year gap before Batches 3 to 7 came along in 2017 - all with age statements, either 21 or 25 Year Olds oddly enough. Last year just three batches were released. The most recent batches released since November 2018 are 10, 12, 12, and 14. You might be wondering where the intermediate release have gone? These batch numbers are reserved for US releases. Nose: Fruit salad sweets and lemon drops with a touch of syrupy ginger. Taste: A sweet entry followed by a lemon sherbet fizz. There’s more of that ginger too. Finish: A herbaceous finish with a leafy freshness and juicy green grapes. Nose: Very rich on the nose with treacle, plums and subtle honeysuckle coming through. Taste: At first a sweet and thick mouthfeel with toast and honey, a prickle of ginger and eventually a dryness cutting through. Nose: Rich and complex with oak, cocoa, juicy black cherries and toasted oats. Taste: Smooth toffee notes to start followed by tropical fruits and warming cinnamon. Finish: A dry finish with more oaty flavours coming through. There’s also a final hint of burnt rubber. Settle yourself down by the Christmas tree with a sip of something delicious-y and a box of tissues to hand. We’ve asked Boutique-y Dave to look back at 2018 - and there won’t be a dry eye (or glass) in the house by the time you’ve finished reading this. As I get older the years seem to speed by ever faster, and 2018 has followed the trend running away with such pace I was almost out of breath by the end of November. But looking back through the year, we have covered an awful lot of ground, in terms of distance travelled, and milestones reached! It has been a record year for new releases, easily surpassing our 2016 record of 66 new batches for the UK market back in July. Even while writing this summary, the number has been rising and last night I counted 165 releases! It’s not only UK releases that have kept us busy this year though. Special releases have gone out to a number of our distributors around the globe as well. We’ve introduced a huge number of new labels this year, FORTY to be precise, keeping the very talented artist Emily Chappell super busy! There are 95 ‘established’ malt whisky distilleries in Scotland (the youngest in my list being Kilchoman in 2005) and to date, we have bottled 72 of these 95 (I’ve included the ‘teaspooned malts’ and the secret distilleries in this total). In 2018 we released our first batches from Tamnavulin, Dalmore, Tamdhu, Glen Ord, Tomatin, Inchgower, Glenlivet, Glencadam, Dufftown, Glendullen, and most recently Balmenach, Teaninich, and the long closed Rosebank! There are of course many new distilleries that have opened since 2005, and continue to be opened, but I only review these at the end of the year. In 2018 that number has risen to 27, and to date, we’ve managed to bottle one from this list. We continue to seek interesting whiskies from around the world, and 2018 also saw our first releases from New Zealand, South Africa's Three Ships, Swedish distillers Smögen, Swiss distillers Santis, The Cotswolds distillery from England, a Karuizawa from Japan, and a number of US whiskey makers; from Tennessee Bourbon, the Reservoir Distillery, James E Pepper, Heaven Hill, and Distillery 291. Once again I’ve been to Whisky Festivals up and down the country, meeting some fabulous people and sharing some wonderful whiskies, from Soho down to Brighton - I must have played them all! I’ve picked up whisky glasses from most events over the years, and this had to stop, I simply cannot house any more whisky glasses! You really don’t need to know just how many whisky glasses I have, but it went into three digits sometime ago. However, I found a solution to my magpie habit during 2018. I can still pick up a festival glass, and take it home at the end of the day. To ease the storage problem, I’ve been taking the glass along with me to the next festival to find a new home. In early May I headed up to the Spirit of Speyside. It was both mine and the brand’s first time at this festival although I had visited the are many times before. My first event was a tasting in conjunction with Mike Lord and his Dufftown Whisky Shop team at St James Hall. Wherever possible I like to hold tastings blind, not to catch anybody out, but to simply remove any preconceptions about the whisky we’re tasting. As it was our first time in Speyside I decided that all of the whiskies should be recent/current releases from Speyside distilleries. To reveal each whisky this time, I had our labels printed up on canvas and auctioned them all off at the end of the tasting, raising an impressive sum for The Whisky Shops’ chosen charity. I also found myself hosting a tasting alongside the ‘Whisky Bard’ himself, Robin Laing, at a gala dinner at the Tannochbrae Guest House in Dufftown. Robin is one of Scotland's premier folk singer-songwriters, and a prolific writer too - one of my favourite books is ‘The Whisky River’ which tells the story of the Speyside Distilleries. I’d chosen an eclectic mix of Boutique-y releases for this dinner, and chef James had matched a whisky with each of the courses. I even cheekily sneaked in an English whisky to finish the evening off! Fear not - I’m currently making plans for SoS 2019. Then at the end of May I headed to Islay for the very first time and held a couple of Boutique-y Whisky tastings aboard the S/V Irene while moored at Port Ellen Harbour. Port Ellen harbour is a fabulous setting for a whisky tasting, especially when the sun is out! Being aboard a historic yacht added to the atmosphere, although being boarded by a very noisy party from The Flying Dutchman during the first tasting wasn’t in my plans. Fortunately the second tasting later on in the week wasn’t interrupted. The weather was kind throughout my stay, so kind in fact I think I might have even got a touch of sunstroke after Bruichladdich day despite doing my best to keep out of the sun wherever possible. I’m certainly looking forward to hosting some similar tastings at next year’s Feis Ile, so keep your eyes peeled! This year I’ve also spread my wings a little further afield with trips to support our distributors across the world; With Bresser and Timmer in The Netherlands at The Den Haag Whisky Festival, with Mac-Y in Denmark and their Rum and Whisky Festival held in Frederiks, with Hua Yang in Taiwan for Whisky Live Taipei and with Whisk-E in Japan at the recent Tokyo Whisky Festival. I have spent a fair bit of time in South East Asia in my earlier career, but I’d never been to Taiwan and Japan before. I’d like to say thank you to a few people who have stepped in to help at some of the busier UK shows; to Emily Tedder and Claire Vokins, aka the ‘Dream Team’ for their help during two busy London shows, and to Sorren Krebs (aka @ocdwhisky) who stepped in to fly solo at a couple of festivals for me when I was required elsewhere. It’s been another successful year for That Boutique-y Whisky with many of our releases picking up awards from the key award bodies; The Scotch Whisky Masters, The Irish Whiskey Masters, The World Whisky Masters, The International Wine and Spirits Competition, The International Spirits Challenge and most recently were were awarded Independent Bottler of the Year for both American Whiskey and Scottish Highland Whisky by Whisky Magazine. I changed my career for whisky. Just ten years ago I knew nothing about whisky at all. Then one whisky, brought to me by a work colleague, friend, and whisky enthusiast, changed my world completely. From whisky curious, to whisky blogger, to being awarded an Icon of Whisky award for World Whisky Brand Ambassador of the Year earlier this year was simply mind blowing! There are so many people within the industry that have supported me along the way, far too many to list here, but you know who you are, and I thank each and everyone of you! I’m signing off for 2018 and taking the rest of the year off! (you’ll still see me on Twitter I dare say!) so I’m going to take this opportunity to wish you all a very Merry Christmas and a peaceful and prosperous New Year! Thank you all for making so many memories this year. 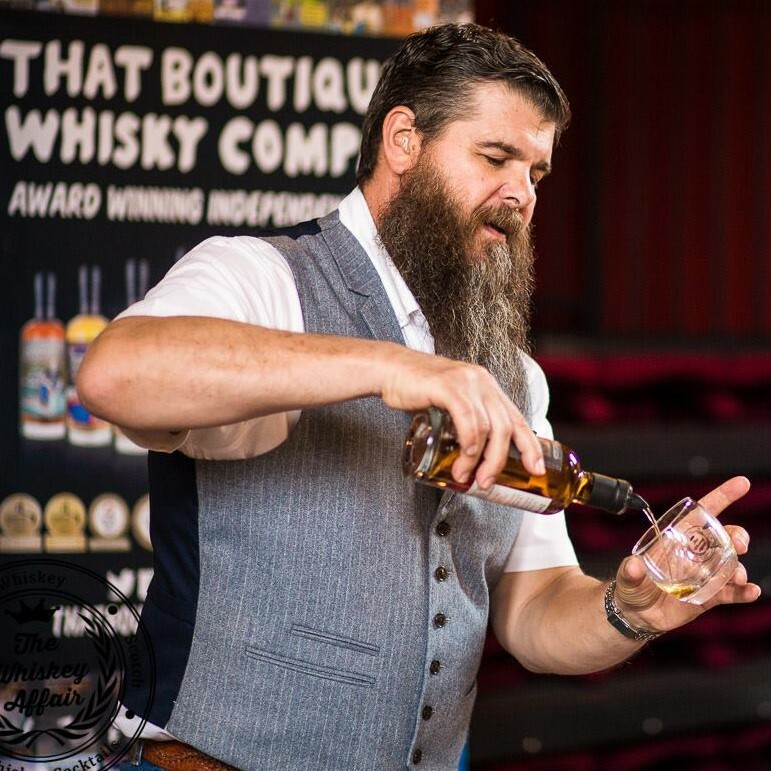 I’m looking forward to sharing my passion for Boutique-y Whisky all over again next year! There are many, many things we love about our beloved That Boutique-y Whisky Company but, we'd typing until our fingers cramp. And of course, we’ve got blends to be blending, teaspoons to be spooning and other important whisky matters to attend to. In honour of That Boutique-y Whisky Company’s 6th birthday, we’ve chosen 6 defining moments in our whisktory to share with you. We've got two secret single malts to announce today, one from Speyside and one from Islay. The distillery names shall not be mentioned at all, so please don't ask! 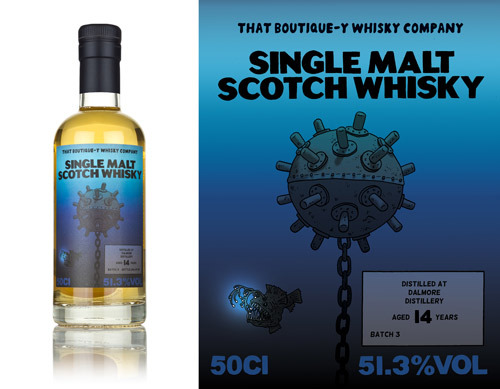 The first is long aged single malt from Speyside - our first ever batch from Speyside Distillery #1 is a 50 year old! That's right, this treacle-coloured malt has been slumbering for over half a century. Just 604 bottles were filled at 48.6% abv. The second secret hails from Islay. 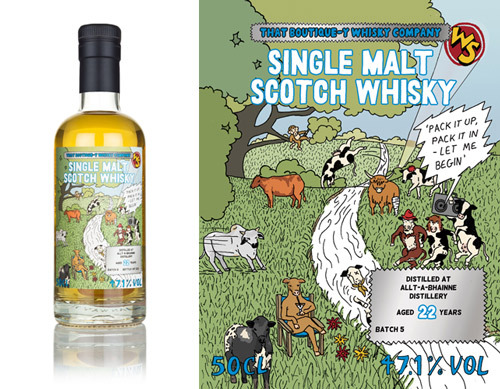 It's our first batch under the Islay Distillery #3 label, but you may recognise the artwork... It's a heavily peated 7 Year Old, so you can expect plenty of those yummy medicinal notes here. Bottled at 49.2% abv, we've filled just 830 bottles. We've got four new releases to shout about today. Whoop! A heavily peated Octomore, two Speysiders from Benriach and Glen Moray, and a single grain from Loch Lomond. First up is our second batch of Octomore, a 10 Year Old bottled at 48.8% abv. We've filled 1,195 bottles of this ultra heavily peated Islay single malt from the Bruichladdich distillery. Expect medicinal notes alongside salty sea spray. Our first (in this announcement) whisky from Speyside hails from the Benriach distillery. Batch 5 is a 6 Year Old bottled at 49.7% abv, and just 377 bottles have been filled. This ain't your usual Speyside malt though, as it's a peated Benriach, mmmm very interesting! It's been five long years since our last batch from the Glen Moray distillery, so we're pretty excited about our latest batch. Our second batch is a 10 Year Old bottled at 48.6% abv. Just 376 bottles of this charming Speysider have been filled. If you like banana bread, you're going to love this! 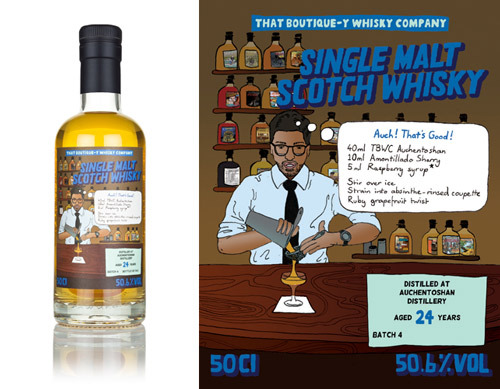 A fourth batch of single grain from the ever adaptable Loch Lomond distillery is our final new release today. There are 502 bottles of our 21 Year Old bottled at 48.4% abv. Think of buttered corn on the cob with a dusting of black pepper. It's dangerously drinkable! We've got not one but two new batches of Bunnahabain being released today, alongside whisky from Inchgower and Port Dundas! First up we've got Batch 5 of our Bunnahabhain bottlings - this one is an 11 year old expression from the Islay-based distillers, bottled at 49.5% ABV. Though youthful, this is a complex dram boasting winter spice, salted peanut and flapjack notes. 1,091 bottles were produced. Now, if you got quite a lot of enthusiasm for Bunnahabhain (enthusihabhain? ), perhaps you're already looking forward to Batch 6. Well, surprise! Batch 6 is already here! It's a 26 year old single malt, bottled at 41.9% ABV with a small run of only 129 bottles. Grab one while you can! With the Bunnahabhain boffins satiated, we look to Speyside for something a little different - our third batch of Inchgower! This 14 year old from Inchgower is packed to the brim with orchard fruit and honey, making it a great dram for the warm summer evenings we're experiencing at the moment. 1,096 bottles were produced. And finally, our newest batch of single grain from Port Dundas has arrived too! A wonderfully creamy 8 year old single grain from the sadly closed distillery in Glasgow. 521 bottles were produced, bottled at 53.6% ABV. The Reservoir Four have arrived on our shores! Along with some top-notch new batches, we've got a quartet of brand new bottlings from Reservoir Distillery! The aforementioned distillery is the Reservoir Distillery in Virginia, and the four expressions explore the profiles of three major grains used in bourbon production. The initial three are each made with a single grain - there's a 100% Corn bottling, a 100% Rye bottling and a 100% Wheat bottling - while the Bourbon is a combination of these three grains. Each expression has been aged for 2 years before we bottled it up. 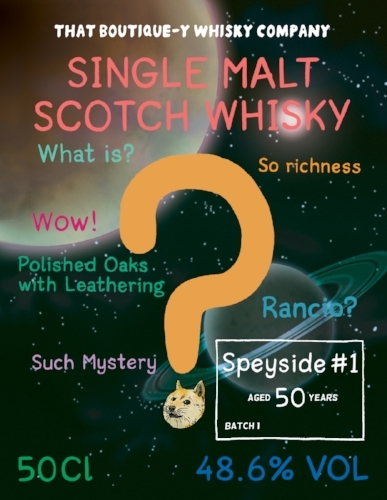 We've also got another first for you today - our first blend of Scottish and Japanese whisky! This 21 year old expression is made from Scottish and Japanese malt and grain whiskies, and has been bottled at 43% ABV. 1,100 bottles were produced, each featuring a dragon and a lion on the label, seemingly getting ready to fight. Honestly though, if a fight between a lion and a dragon did happen, the dragon would clearly win. It can spit fire. With all these new whiskies, perhaps it's time for something old? Very old, perhaps? With that in mind, take a peek at our fourth batch of Miltonduff, which has been aged for 40 years! Boasting a dark hue and an ABV of 47%, there are only 478 bottles of this whisky, so grab one while you can! The second batch of our Blended Malt #3 ready to hit the stage! This wonderful 'teaspooned' malt is a 21 year old expression, made almost entirely with whisky from one distillery (alongside a touch of whisky from a different distillery). 1,323 bottles were produced. We've also got the newest batch of Ardmore single malt bottled up for you to sink your teeth into! This time, we've bottled a 14 year old whisky from the distillery, and it's definitely one for those of you who love your peaty treats. A release of 582 bottles. And finally, say hello to our latest batch of Glen Elgin! This 22 year old single malt is an enjoyably spicy tipple, with enough banoffee pie notes to balance it all out. We've got 434 bottles ready for you to crack open. Two new releases to shout about today; one from the hills of Speyside the other from Islay's coast. Our sixth batch from the turf of Speyside's Benrinnes distillery is a 26 Year Old. The Benrinnes distillery was completely rebuilt in the 1950s and is long associated with Crawford blended Scotch whisky. Nothing of the original distillery remains today, and the partial triple distillation process that used to be the norm has been abandoned recently. Just 164 bottles at 50.8% of this release have been filled. We figured we'd start the show with a show-stopper in every sense - it's our very first bottling of Dufftown single malt, and it's a 40 year old expression! Look closely at the label and you may spot a few familiar faces... Only 164 bottles were produced. How about another first, eh? We've also released batch 1 of Glendullan single malt! It's a youthful 7 year old single malt from the Glendullan distillery, bottled at 51.7% ABV. 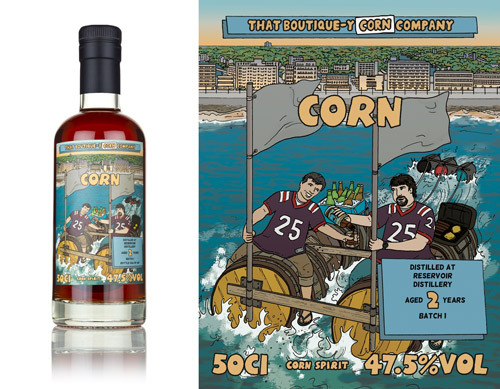 Just 387 bottles were produced, each adorned with a label featuring a scene at the Space Olympics. Don't ask why. We barely know either. A third first, you say?! Of course! Behold - the first batch of our Blended Malt #5! 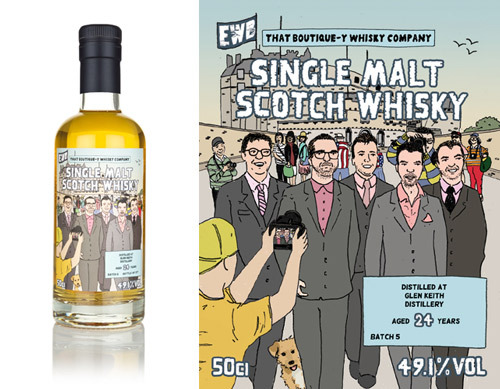 Those of you with an extensive knowledge of Boutique-y labels might recognise some of the characters on this 21 year old whisky's label as they enjoy some delicious pie. A release of 449 bottles. We've also got some new batches of top notch whiskies, including batch 8 of Springbank single malt! It's a deliciously sherried 21 year old expression, with a core of earthy smoke hiding beneath the sweetness. 911 bottles were produced. Up next is batch 5 of Glenrothes single malt, this time matured for 20 years before we got our hands on it for bottling. Just 225 bottles were released, so if you simply adore gorgeous Glenrothes whisky, you'll want to grab one while you can. Finally, we've gone and bottled up another batch of Strathmill single malt! Sitting at 21 years old, this whisky boasts plenty of fruity esters, oloroso sweetness and a hint of charred oak. A release of 401 bottles. We've got a ten new batches of single malt Scotch whiskies to share with you today - so let's get stuck in! We've been very busy indeed getting a whole load of brand new batches from top Scotch whisky distilleries, including a few that we haven't bottled in quite a while. Well now is the time to enjoy the fruits of our labour as we show off ten new bottlings! So, let's start with a bang - 29 year old Macallan! Oh yes. We've managed to get our hands of an absolutely brilliant 29 year old single malt from the Speyside-based distillery, and it's been bottled at 47.3% ABV with an outturn of only 217 bottles. Continuing on the Speysider theme, behold our fourth batch of Auchroisk! A youthful though flavoursome expression from Auchroisk, matured for just 7 years before we bottled it up at 52.1% ABV. 502 bottles were produced. Everyone is talking about Islay these days, what with Fèis Ìle 2018 happening and all. It only seems right that we unveil our fourteenth batch of Ardbeg! This smoky treat was aged for 12 years before being bottled at 49.2% ABV, with 1,928 bottles being made. After it's first batch, we heard a call for "More Dalmore!" Well, we're more than happy to oblige! We've bottled another batch of Dalmore single malt, this time aged for 14 years before being bottled at 51.3% ABV. 811 bottles are ready to find new homes. It's been a few years since we bottled up some Blair Athol single malt, so we decided to change that! Observe, it's our second batch of Blair Athol, aged for 17 years and bottled at 48.8% ABV. Only 502 of these bottles were produced. Speaking of whiskies that we haven't bottled in a while, we've also managed to bottle our second batch of Inchmurrin single malt from the Loch Lomond distillery! It's a 23 year old expression, bottled at 47.3% ABV with an outturn of 285 bottles. We've also bottled our fifth batch of single malt from the Strathmill distillery. At this point, we may have ran out of 'Goldilocks & the Three Bears'-based puns to announce these whiskies, so we'll just stick with "It's yummy". Batch five is 11 years old, bottled at 51.1% ABV and with an outturn of 702 bottles. Feast your eyes upon the fantastic Fettercairn that we've just bottled! This one is 21 years old, bottled at 48.6% ABV with 669 bottles produced. Packed to the brim with caramelised fruit and vanilla-rich barley, this one. Goat and whisky enthusiasts will be more than happy to here that we've bottled our second batch of Inchgower single malt! This one is 17 years old, and has been bottled at 47.4% ABV with an outturn of 225 bottles. And finally, say hello to our fourth batch of Linkwood single malt! It's 11 years old, and has been bottled at 51.2% ABV with an outturn of 956 bottles. 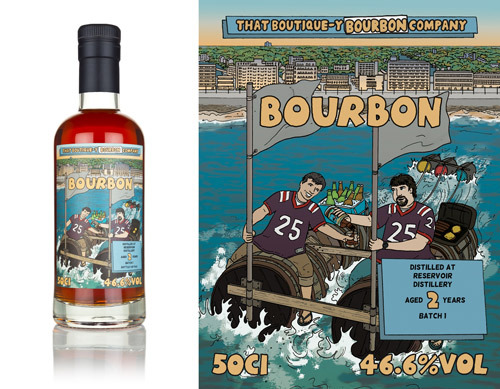 We're still rather pleased with the Ship of Theseus/Only Fools and Horses/actual whisky story referencing label. A Massive Medley of New Releases! We're always busy here at TBWC HQ, and we've been particularly active as of late - as demonstrated by this litany of new bottlings! It's time for another huge haul of new That Boutique-y Whisky Company bottlings to fly the coop, so to speak. The TBWC HQ is a bit fancier than a coop. There's significantly less hay than your everyday coop - which is a blessing and a curse, really. Sometimes you really just want a big pile of hay to sleep in. Anyway. Whisky! It's been quite a while since we bottled a Caperdonich single malt, but the Caperdonich drought (Caperdrought? Does that just sound like an intense lack of capers?) has ceased! Our first batch of Caperdonich with an age statement - this one is a 22 year old expression, bottled at 48.6% ABV. Only 250 bottles of this rare single malt were produced. We've just bottled our 11th batch of single malt from the Islay-based Bruichladdich distillery, and this one is a wonderfully flavoursome expression. Bottled at 13 years old, with an ABV of 47.6%, expect oodles of juicy fruit notes and a hint of salinity. 478 bottles were produced. 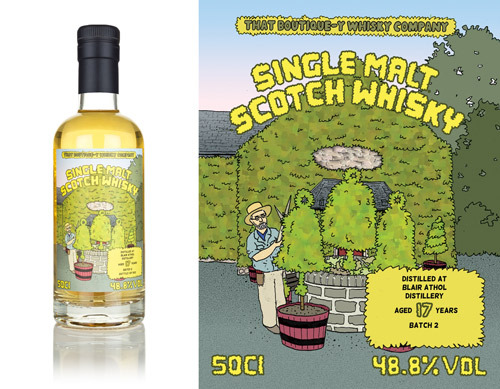 We're heading to the Lowlands for this next one - it's Batch 4 of our Auchentoshan! This one was matured for 24 years, and bottled at 50.6% ABV. A classically gentle Lowland, with a zesty kick of citrus at its core. A release of 542 bottles. 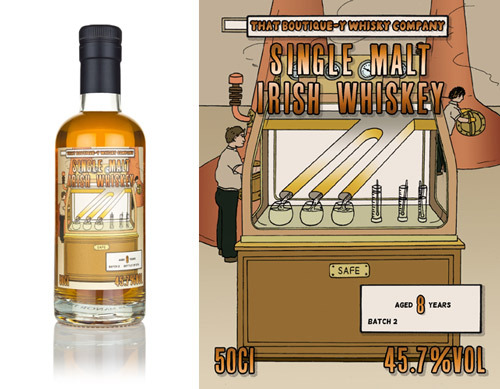 "Pack it up, pack it in, let me begin..." to tell you about our newest bottling of Allt-á-Bhainne single malt! For Batch 5, we've bottled up a terrific 22 year old expression, with only 222 bottles produced. Couldn't have planned that better if we tried. It's important to remember that Scotland isn't the only place that makes whisky - why not branch out a little bit and treat yourself to a fantastic Single Malt Irish Whiskey! We've bottled this stunning expression at 8 years old and 45.7% ABV, producing 876 bottles. We've bottled another stunning Aultmore! Batch 8 is a 20 year old expression, bottled at 52.1% ABV with an outturn of 997 bottles. The shark and velociraptor remain at odds with each other. Some things never change. We've got a new bottling of Benrinnes, too! For Batch 5, we got our hands on a splendidly delicious 17 year old single malt, and bottled it at 47.6% ABV. A release of 940 bottles. 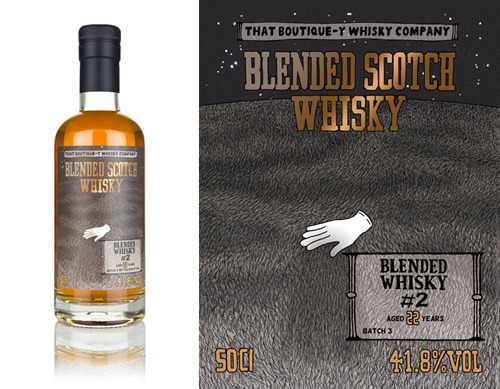 People keep sending things into space (cars, botanicals, humans), with the intent of finding a planet which is completely covered in fur, like on the label of our Blended Whisky #2. None have been successful, but never fear - we've released a new batch to reignite the fires of discovery! This one is 22 years old, and 1,650 bottles were produced. Many moons ago we released our first batch of Dailuaine. Seems like it's about time we got our act together and bottled Batch 2, don't you think? Well surprise! We predicted that you would agree with that question and have Dailuaine Batch 2 already ready! It's a 15 year old expression, bottled at 47.5% ABV with an outturn of 950 bottles. The hits keep coming - we've got Batch 5 of our Glen Keith single malt ready to go! We've bottled another wonderful 24 year old whisky from the distillery in Speyside, producing 377 bottles presented at 49.1% ABV. Feast your eyes upon our first BenRiach bottling with an age statement. 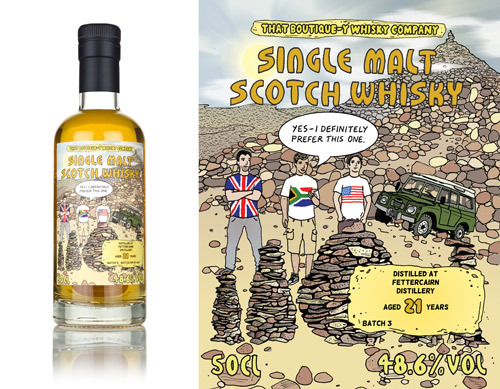 This is a 9 year old single malt, presented at 51.7% ABV and with 2,501 bottles produced. We thought 2,500 bottles wouldn't be quite enough. Another first - our very first bottling of Glencadam single malt is here! A youthful expression, bottled at 6 years old at 47.5% ABV, but it's by no means a straightforward dram. 454 bottles were produced. Finally, we couldn't help but treat you to another excellent single grain from Invergordon! For Batch 16(! ), we've bottled a 10 year old single grain, boasting a vanilla-forward flavour profile with hints of floral freshness in the background. 217 bottles were produced.